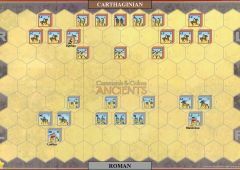 Hannibal has completed his epic march across the Alps, but has lost fully half of his soldiers in doing so. 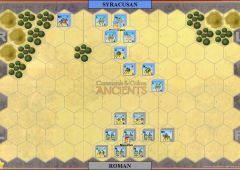 The Consul in Southern Gaul, Publius Scipio, has shadowed Hannibal’s advance following the coastal route. 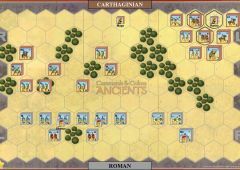 He intercepts Hannibal in Northern Italy as he is rebuilding his army with Gallic recruits. 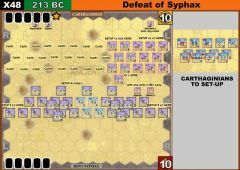 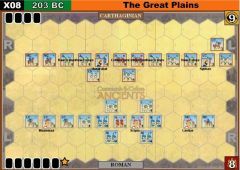 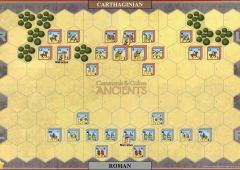 Neither commander is willing to bring on general battle, but Scipio does advance his light troops and cavalry, unaware of how much better the Carthaginian cavalry was than his own. 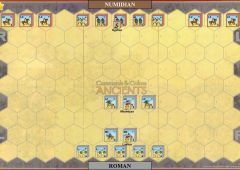 Hannibal counters with his cavalry, including the fearsome Numidian light horse. 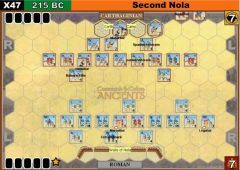 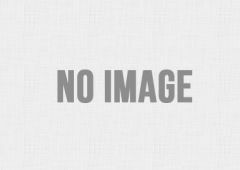 Hannibal gives Scipio a tactics lesson. 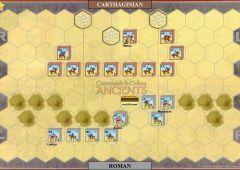 His heavy cavalry smashes into the light infantry, drawing the Roman cavalry into the fight. 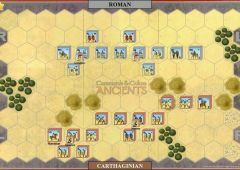 At that point, the Numidians hit both flanks, driving off the disorganized surviving cavalry, wounding Publius Scipio in the process. 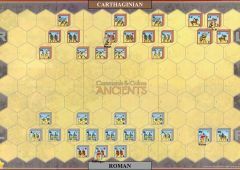 One capable Roman now knew how formidable Hannibal’s army was. 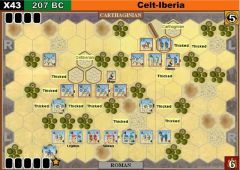 Unfortunately, three other inept Roman Consuls would lose thousands of Roman soldiers at The Trebbia, Lake Trasimenus, and Cannae because they failed to heed the warnings. 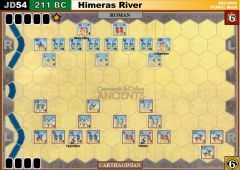 Ticinus River is not fordable. 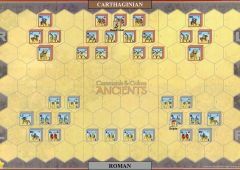 Very narrow Roman win 6-5. 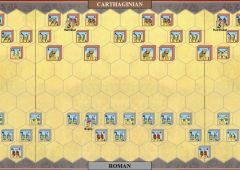 Rome's light foot were never able to make much difference - it was a cavalry match up. 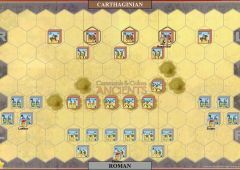 Carthage's heavy cavalry dealt severe losses to the Roman centre but the Roman left flank obliterated Carthage's right even more definitively. 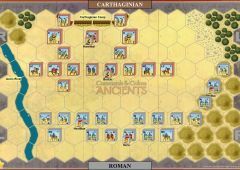 Two wins for Carthagians; both games involved clearing roman left flank and carthagian heavy cavalry hitting hard, finishing the job. 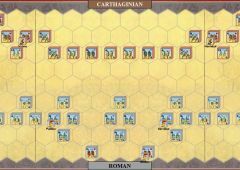 Since it's a pretty short scenario the players switched armies after the first game. 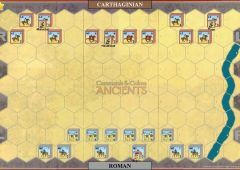 Playing solo tonight, a surprisingly close and tense 6-5 victory for the Carthaginians. 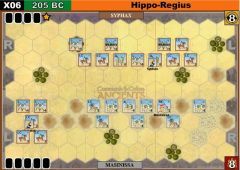 The Roman Light Infantry did their job deterring the Heavy Infantry and Scipio did good work accompanying the two Medium Calvary units to route Mago and Maharbal's Light Calvary Units (forcing the retreats of both leaders!). 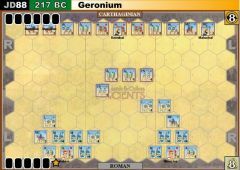 Eventually Hasdrubal took matters in to his own hand and accompanied by one other Heavy Calvary unit wiped out enough of the Roman Calvary units to capture the last few required banners. 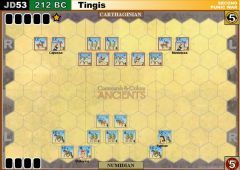 6-2 for the Carthaginians, it wasn't even close as the Roman flanks failed to get organized before the Heavy Calvary came crashing into the Roman Light Infantry lines. 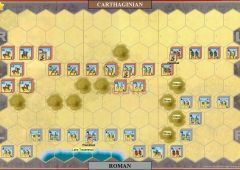 Scipio managed to eventually draw some blood on the Carthaginian left flank but it was too little too late. 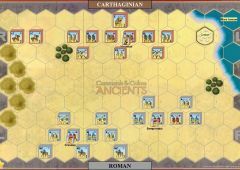 Just played the scenario twice with a friend. 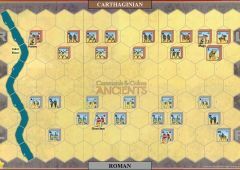 The Romans won both times: 6-5 and 6-4. 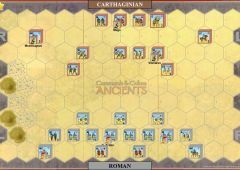 The Carthaginian Light Cavalry are very weak and even the Carthaginian Heavy Cavalry are inferior to the excellent Roman Medium Cavalry. 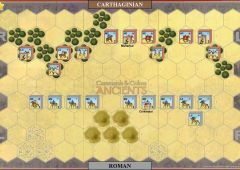 With the greater speed of the Medium Cavalry, they can strike first versus the Carthaginian Heavy Cavalry, and with a leader present and the ability to momentum advance, they can wreak havoc. 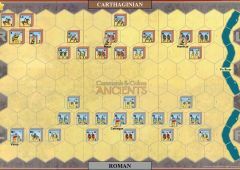 An easy victory for the Carthaginians, with all the work done by the right flank. 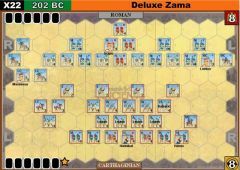 The light cavalry advanced quickly enough to push the medium cavalry back against the edge of the board, eliminating three units, then turned on the light infantry and quickly overwhelmed the rightmost three, all while losing only one unit of light cavalry with two others damaged. 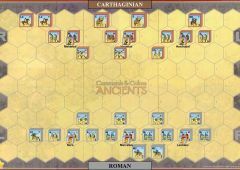 As expected, the mounted Carthaginian force surrounded and overwhelmed the Romans. 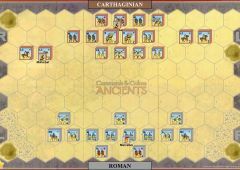 They started by pushing their heavy units into conflict against the Roman light units to cause chaos. 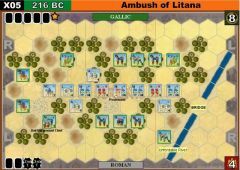 The grabbed a substantial number of banners before being broken and defeated. 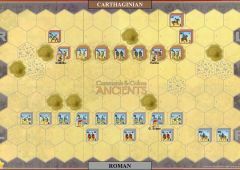 Having their light skirmishers pretty much decimated or scattered forced the Romans to move the cavalry forward to damage the Carthaginian flanks. 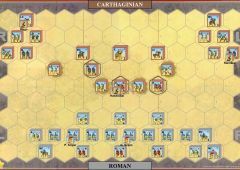 Unfortunately, the light cavalry was able to quickly move in and cut off retreat and annihilating any Roman cavalry that advanced. 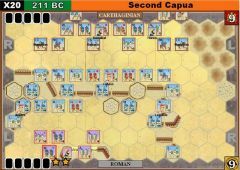 The Romans also took a huge early hit when their leader fell on the third turn. 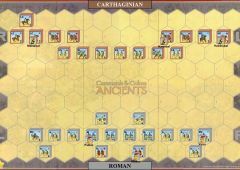 The battle started positively for the Romans. 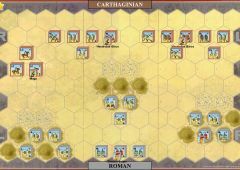 They managed to shatter the Carthaginian left flank and take two quick banners. 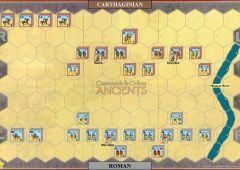 After this, it seemed like the Romans were just out of reach of a slaughter. 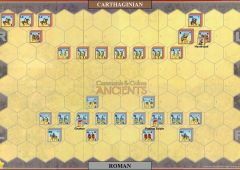 They managed to cut off retreat several times, but could never manage to kill any of the heavy cavalry. 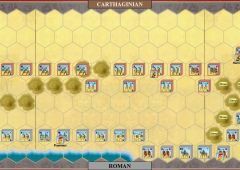 Despite their pathetic tactics and poor orders, Carthage overcame this by just being extremely lucky managing to survive several attacks that should have cripple them. 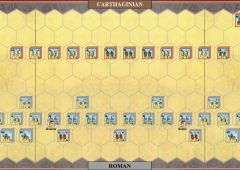 Though the final banner count makes it look like a complete blowout, the remaining Roman units were all at full strength and the Carthaginians had four units with a single block left. 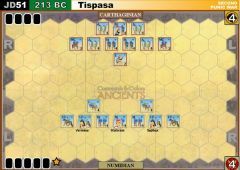 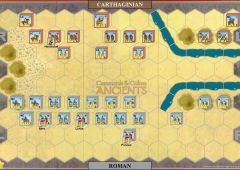 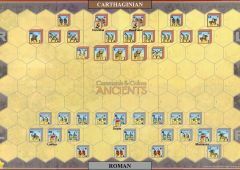 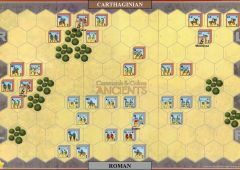 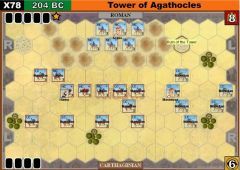 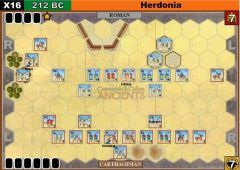 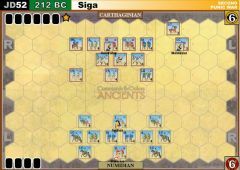 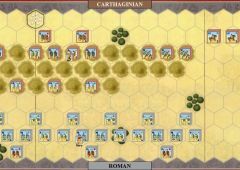 This scenario hands the Carthaginians the interesting challenge of managing an all-cavalry army. 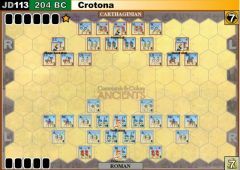 On the one hand, otherwise powerful cards like Line Command stop being useful. 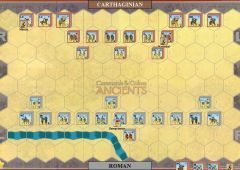 On the other hand, a Mounted Charge at the right time can wreak havoc on the Romans. 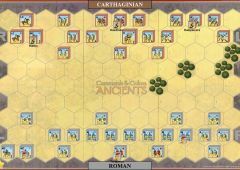 The Romans have to somehow keep the Carthaginian center from engaging their light infantry, which simply cannot long survive close combat with heavy cavalry. 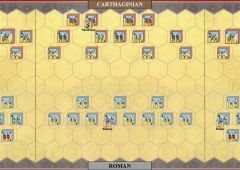 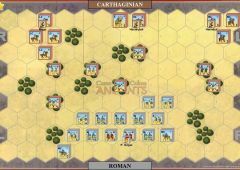 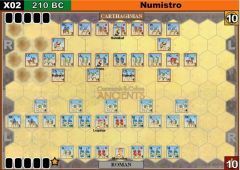 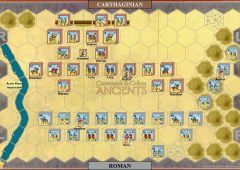 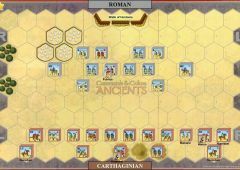 The targets of opportunity for the Roman are the light cavalry on the Carthaginian wings — but, because of the evasion mechanic, they have to be attacked from fairly far forward before they are likely to take real damage. 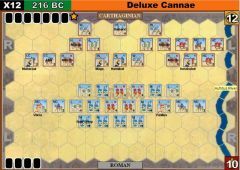 The Romans must, somehow, take the offensive. 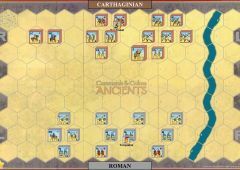 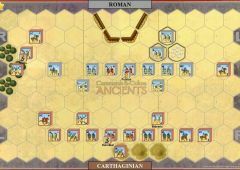 If you think this scenario tilts towards the Carthaginians, you can give the Romans +1 command card.